Cottage cheese, also known as curds and whey, is a fresh cheese curd product with a mild flavor. It does not have any added color and is not aged. It is made not by pressing the cheese but by draining it, which allows some of the whey to stay which keeps the curds loose. Cottage cheese is low in food energy compared to some other types of cheese. As a result, it is popular among dieters and some health devotees. It can be used in a wide variety of foods such as yogurt, fruit, toast, granola, in salads, as a dip, and as a replacement for mayonnaise. Cottage cheese dates back to the ancient Mesopotamia 3100–510 BC, where it was first found accidentally made in a sheep's stomach bag. It was later made in cottages using leftover milk. During World War 1, it was widely promoted in the United States, in order to save meat for infantry rations. Cheese was discovered by humans while storing milk in animal stomachs, which were used as containers. The enzymes from the stomach would have induced a coagulation process separating the curds from the milk. The first evidence of cottage cheese specifically can be found in a band of carvings on the walls of an ancient Mesopotamian temple that date back to 3,000 BC. The ancient carvings show the process in which the civilization created a cottage cheese substance, using salt and milk to create a sour curd mixture believed to be very similar to today's cottage cheese. As cheese making became more of a science and staple of cultures diets, many varieties popped up around the world. Cottage cheese was widely promoted in America during World War 1, along with other dairy products, to save meat for infantry rations. This promotion was shown in many war posters. One pound of cottage cheese contains more protein than a pound of lamb, pork, beef, or chicken. Cottage cheese is created by pasteurizing or heating skim milk until it hits 142–143 °F (61–62 °C) after which it is cooled to 90 °F (32 °C). 5% of culture is added to the skim milk mix which allows the milk to curd and solidify. The solid skim milk, more commonly referred to as curd, is cut into cubes with wires as soon as the gelatinous curd has been formed. After the curd has been cut into cubes it is then reheated by water poured into the vat. Over time the whey begins to separate from the curd being replaced by the water. Once the curd has been drained of the water and is mostly dry it is pressed to further dry the curds. The curds are then finally rinsed and salt is added. Afterward, cream is added, and the result is packaged and shipped for consumption. The nutritional levels of cottage cheese vary depending on the level of milk fat used and how much sodium is added. Cottage cheese is popular among dieters and some health food devotees. It is also a favorite food among bodybuilders, runners, swimmers, and weightlifters for its high content of casein protein (a long-lasting protein) while being relatively low in fat. Pregnant women are advised that cottage cheese is safe to eat, in contrast to some cheese products that are not recommended during pregnancy. Cottage cheese is known to be a dieting food for its health benefits. It is used as a substitute for meat due to the high levels of protein which meats contain but less total calories and fat. For that reason cottage cheese is a substitute in many cheese based foods. Many recipes such as lasagna which uses ricotta cheese can use cottage cheese instead and will have a better nutritional value. In the United States cottage cheese is popular in many culinary dishes. It can be combined with fruit and sugar, salt and pepper, fruit puree, tomatoes, and granola and cinnamon. It can be eaten on toast, in salads, as a chip dip, as a replacement for mayonnaise in tuna salad, and as an ingredient in recipes such as jello salad and various desserts. Cottage cheese is also popular with fruit, such as pears, peaches, or mandarin oranges. ^ "History of Cheese - National Historic Cheesemaking Center". Nationalhistoriccheesemakingcenter.org. Retrieved 21 February 2019. ^ "The History of Cheese - An Ancient Tradition - Today An Artisan Industry..." Gourmetcheesedetective.com. Retrieved 21 February 2019. ^ "History of Cheese - International Dairy Foods Association". Idfa.org. Retrieved 21 February 2019. ^ "The Milwaukee Journal - Google News Archive Search". News.google.com. Retrieved 21 February 2019. ^ Iva A. Dingwall. "Pioneers' Dinner Table" (PDF). Collections.mnhs.org. Retrieved 21 February 2019. ^ "08-069: Pioneer Cheese Making – South Peace Historical Society". Collections.mnhs.org. Retrieved 21 February 2019. ^ "Sow the Seeds of Victory! Posters from the Food Administration During World War I". National Archives. 15 August 2016. Retrieved 21 February 2019. ^ "The Manufacture of Cottage Cheese in Iowa Creameries and Milk Plane". The Manufacture of Cottage Cheese in Iowa Creameries and Milk Plane: 16. 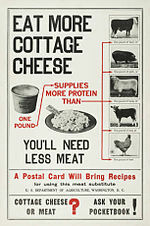 ^ "Cottage Cheese | The California Dairy Press Room & Resources". Californiadairypressroom.com. Retrieved 2019-02-21. ^ "Why Cottage Cheese Is Super Healthy and Nutritious". Healthline. 2016-10-04. Retrieved 2019-02-20. ^ "Eating cheese during pregnancy". Babycentre.co.uk. Retrieved 2009-10-18. ^ Parker-Pope, Tara (2010-08-20). "Cooking With Cottage Cheese". Well.blogs.nytimes.com. Retrieved 2019-02-21. ^ "Can America learn to love cottage cheese again?". The Independent. 2019-02-20. Retrieved 2019-02-21. 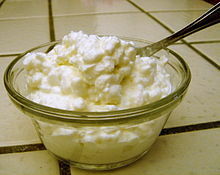 Wikimedia Commons has media related to Cottage cheese.